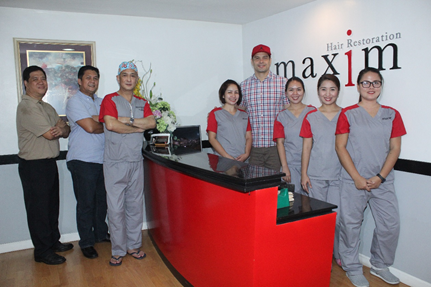 Multi-titled PBA Legend Alvin Patrimonio visited the MAXiM Hair Restoration clinic in Makati, Metro Manila, Philippines, recently to avail of a hair restoration procedure called Follicular Unit Extraction (FUE). FUE is a no-stitch, no linear scar technique that takes individual grafts or follicular units from the back and sides of the head and transplants them to the thinning and balding areas. The result is permanent hair growth that is all natural because the transplanted hair is the patient’s own. There is very minimal discomfort felt during the procedure and recovery is faster. The patient can return to normal activity in a day or two and expect a fuller head of hair in about six months, plus improved density within a year. Unlike other hair transplant clinics that offer multiple cosmetic procedures, MAXiM is entirely dedicated to surgical hair restoration and non-surgical scalp micropigmentation. The hair transplant procedure is performed by MAXiM doctors who are experienced plastic surgeons adept at performing medical aesthetic procedures. MAXiM Hair Restoration is the Manila, Philippines, branch of the New York City-based hair transplant company that also has offices in Long Island, Chicago, Dallas, D.C. Virginia Area, and Dubai. Above, “The Captain” poses with MAXiM Hair Restoration Manager, Mar Sabillo (second from left), Dr. John Ocampo, MAXiM Plastic Surgeon and staff.